Well, guys... I haven't been doing very well with these lately. 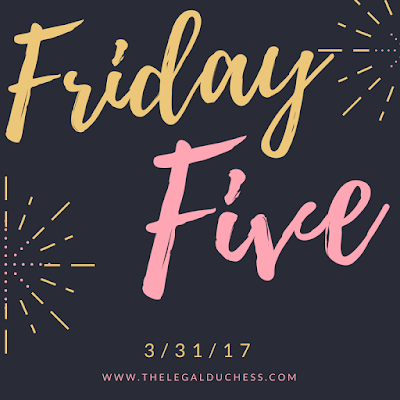 But I am back with the Friday five this week! This week has been busy- I did my oral argument, outlined like crazy, had lots of housework to do.... it was a bit busy. Finals are only 3 weeks away so it is crunch time!! Also, I went to see Beauty and the Beast- unbelievable and perfect. In other news, here's what I have had my eyes on lately! This came out in theatres today and I am dying to go see it. I have heard of this story a few times and it astonishes me every time. The head zookeeper of the Warsaw Zoo and his wife hide and aid many jews during the second world war. It is an amzing story of courage and conviction in the face of horror. This finally came out of DVD tuesday and I, being the giant Harry Potter nerd that I am, bought it immediatly and watched it that same night. It is as good as I remember it being in theatres. Now I cannot wait for the next movie to be released! I did a little online shopping this week.... J.Crew factory had 50% off clearence so I got some killer deals on new items to wear to my internship this summer. Working in the prosecuters office is going to recquire me to dress up every day so I am trying to stock up on blouses, dress pants and pencil skirts now! I have been searching for a new purse so I could retire my 3-year-old Michael Kors and I finally fell in love! This bag is just the right size, has great organization, the look is so classy, the quality is excellent and the price is super affordable. I have it in the "saddle" color. I have been watching this show since the beginning and it is so good. The premise had me worried at first but watching it has me addicted. It involves Jack the Ripper and HG Wells traveling forward in time to 2017 and follows the adventures that follow. A little bit of history, suspense, and two hot British guys- it's a win! It airs on Sunday nights at 9pm on ABC. Well this was slightly movie heavy- you can see where my brain is at lately. Have a great weekend everyone! !